Another day, another eyeshadow palette. Oh no, sorry, make that three. It seems as though I'm currently going through a phase of stocking up on palettes to see me through A/W and beyond. 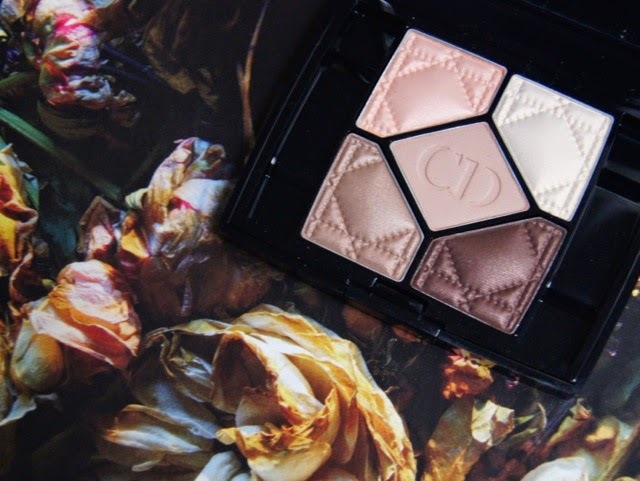 Dior is one of my favourite makeup brands, especially for colour cosmetics. A few of their 5 Couleurs Eyeshadow Palettes proved too hard to resist on a recent Feel Unique sale-shopping spree. As they were reduced, I couldn't ignore such a good offer! 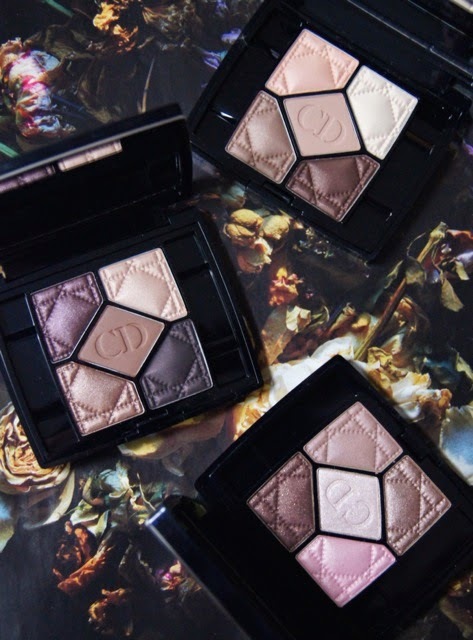 As you'd expect from Dior and their hefty price tags, the formula of all their shadows is impressive, especially now they've had a bit of a makeover for autumn 2014. Combining different finishes, from suede-like mattes, sheeny satins and dazzling glitters, all the colours work in harmony to create a show-stopping result. Highly pigmented, the colours are vibrant and don't need much layering to give a good payoff, wearing for a decent, eight hours before showing signs of dulling-down. 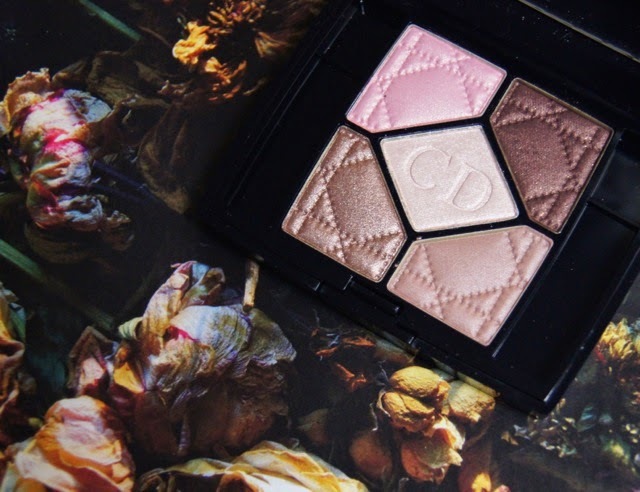 Dior's shadows have a velvety, smooth texture, that blends out with little effort. 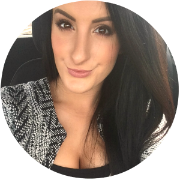 Their matte finishes aren't at all chalky and don't create dusty fall-out that can ruin your base. 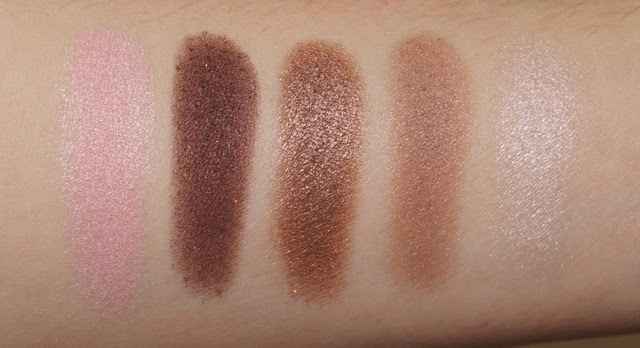 Compared to other high-end brands' eyeshadows, the shadows don't feel as buttery, but I'm glad of that. Sometimes, I find eyeshadows can be too soft, resulting in a smudgy, messy look that doesn't last as long as I expect a powder finish to. Plus, my palette isn't left with a dent in each shadow after just one use, which can happen when they verge on being almost creamy. 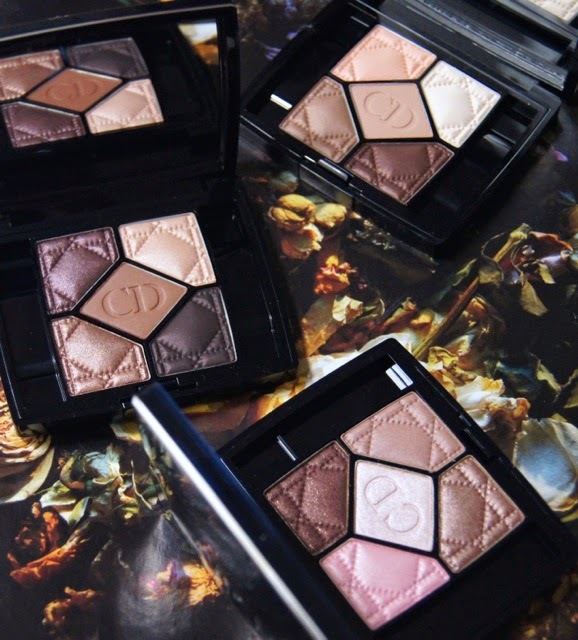 Now that Dior have given their 5 Couleurs palettes a slight remodeling, the compacts are even slimmer and so sleek. 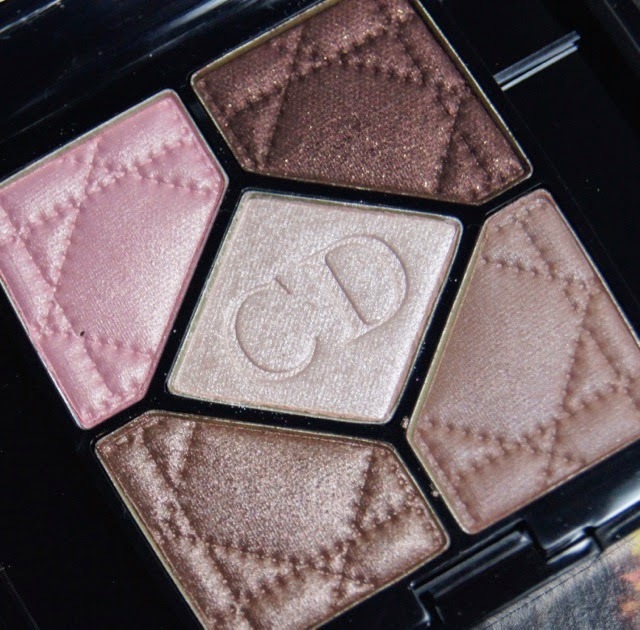 The outer casing isn't too glitzy, but the detailed, quilted embossing on each eyeshadow is such a luxurious touch. As they give you a complete, eye look in one compact, they make a great choice for traveling, especially with the in-built mirror underneath the lid. Originally, each palette comes with two, double-ended applicators, but as you can see, I throw mine away and favor using my own brushes, instead. I find the mini sponges too fiddly to use and they never blend the product out enough for my liking. At £42 a pop, these palettes aren't cheap, but they make a nice treat for a special occasion or a luxury gift for a loved one. If you pick one that you know you'll get a lot of use out of, they're well worth every penny. 30 Montaigne is a neutral lover's dream. No matter the season, this palette can work with any style. Each of the warm-toned shades are so wearable and combine to create a soft look that flatters all skin tones and is daytime friendly. The two, palest shades from the set are perfect to highlight the brow bone and inner corners of the eyes, to really open them up. The off-white shadow has a yellow undertone running through it, so it isn't too cool or frosty and the shimmery, ballerina pink is a nice twist on more classic, neutral shades. The light, metallic gold and deeper bronze are finely-milled enough that they can be worn during the day, without looking too harsh. The one, matte shade in the palette is a peachy pink that is ideal for evening out the eyelids to creating a flawless canvas, or for defining the crease. '30 Montaigne' is the most easy, traditional palette from the revamped range and would make a great staple in any makeup obsessive's collection. 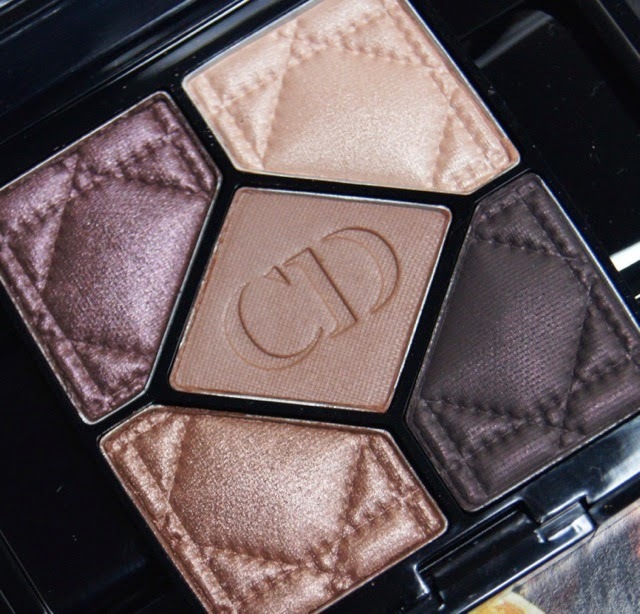 Rosy Tan is actually part of the original 5 Couleurs collection, but it's still available online if you do some detective work and hunt it down. If you like your shadows to be shimmery, then this one will be right up your street. I tend to reach for this one more in the evenings, though. Again, it's mostly made up of browns, but it has more of a cool-toned feel to it (despite still looking warmer in my swatches). The addition of the blue-toned, frosted, bubblegum pink is unusual and makes the palette a little more special. Honestly, I think I'd only dare to wear such a stark pink in S/S, but the other four are appropriate at any time of year. Both the rich, chocolatey, plum shade and the rusty bronze are packed with chunkier, golden flecks of glitter, which add some sparkle to evening looks. The satin-finish, neutral beige has an extremely light helping of silver shimmer in it, but it's almost undetectable on the eye. If you're in a rush, it's the perfect, quick-fix colour to quickly sweep on and pull together your look. The cool-toned, central shade is a sheer, iridescent pinky-oyster, that leans towards silver and gives skin a dewy, wet-look effect. 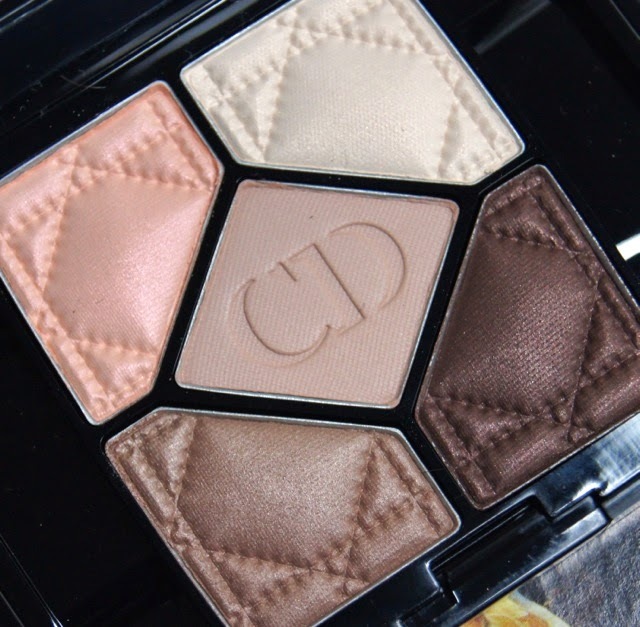 I'm not sure how long this particular palette will remain available, so if you want it, you may need to get a move on and purchase, before it becomes discontinued. My favourite of the trio, is Cuir Cannage. Full of rich shades, this looks so decadent and gives the eyes such drama. The star of the show, for me, is the vibrant, burgundy-plum shade, which is absolutely stunning and compliments brown eyes, emphasizing their depth. The bright, copper isn't a colour I'd normally pair with purples, but they work so well together. The highlight shade is a creamy beige that has a frosted finish. Rather than being overtly glittery, the shimmer running through the three shadows is so finely milled, giving them a soft sheen. The darkest, aubergine brown, that appears black at a glance, has a satin finish and is great used as a smokey liner, if you don't want to use a kohl pencil or liquid formula. 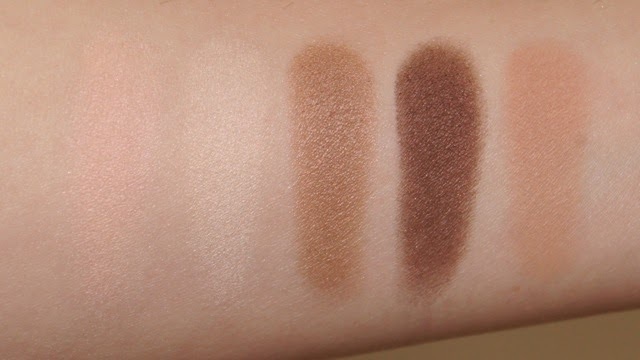 Despite looking more neutral in the pan, the central shade is an orange-toned, camel colour, with a matte finish. 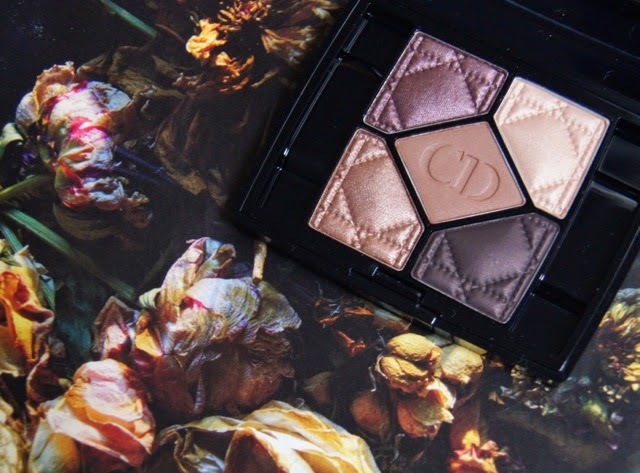 Fitting with the sumptuous, jewel-toned theme for eyes this autumn, I've got a lot of wear out of this palette so far this season and I can see it being my most used during A/W. So gorgeous, love the look of Cuir Carnage! 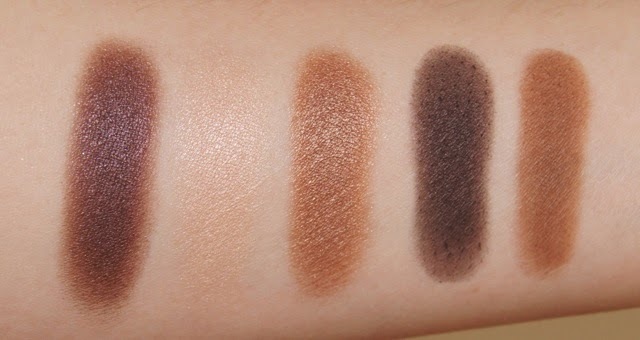 How did you bring yourself to swatch these, the palettes are so pretty!